A win by David Pearson at Darlington Raceway, where he is considered by many to be the all-time master of the track with 10 Cup victories, might not be altogether unexpected. But his third Darlington win, and his first driving for the Wood Brothers, did come as a bit of a surprise to many. Entering that 1972 season, many changes were occurring in NASCAR. The automobile manufacturers that have participated in NASCAR for decades were basically on the sidelines that year. A new series sponsor, Winston, was pumping money into the sport, but there were few lucrative sponsors at that time to help participating teams pay the bills. The year before, Pearson had left Holman-Moody rather than take a pay cut. He signed on with a Pontiac team backed by businessman Chris Vallo, who seemed for a time to have an unlimited supply of cash to spend but was soon gone from the sport. 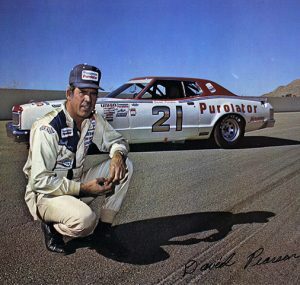 By the time the 1972 season got under way, Pearson, at age 37, hadn’t won a superspeedway race in nearly two years. He was essentially out of a ride despite 60 career victories and three championships. Some were wondering whether his best years were behind him. But when Glen Wood started looking around for a driver to replace A.J. Foyt, who had been running the No. 21 but was scheduled to switch his primary focus back to the Indy car racing, Pearson was No. 1 on his list. Pearson and Wood had known each other for years, and although there were some hard feelings for a time over an incident at Bristol Motor Speedway during the 1965 Valleydale 500, relations were good by the time 1972 rolled around. Wood recalled that the earlier trouble started when Marvin Panch, driving for the Woods, and Pearson, at the wheel of Cotton Owens’ Dodge, crashed hard racing for fifth place after just eight laps. Once the cars were cleared, Wood and Pearson had a pit area “discussion” about what had just happened. “David said: ‘You don’t think I did that on purpose, do you?’” Wood said. “I told him I didn’t, but I did say that I thought he used poor judgment. Wood eventually took steps to reconcile the differences. Pearson’s first race for the Wood Brothers was the 1972 Rebel 400 at Darlington. While most new pairings take several weeks – or even a season – to gel, Pearson and the Woods hit the track with a performance that made it look as if they’d been together for years. Pearson won the pole for that race, led 202 of 293 laps and was a lap ahead of second-place Richard Petty at the finish. His two-year superspeedway winless streak came to a quick end. “Sometimes it takes some time to get to know one another, but I can’t say I was surprised to win the first time out with David,” Wood said. That first win together was a sign of good things to come as Pearson went on to win 42 more races at the wheel of a Wood Brothers’ Ford or Mercury, none of which were considered much of a surprise to anyone.